On January 27th, Apple released the iPad tablet. It had been a highly anticipated launch, with tech blogs and just about everyone on twitter talking about it weeks before the event was even confirmed. Some were disappointed with the product Apple eventually released, but I won’t go into detail. While the iPad is something which will really get the tablet computer market going, various people have been quick to point out that in fact a much older product is almost exactly as good. That product is: A rock. Neither the iPad or rock has a camera. Neither has an OLED screen. However, the iPad DOES have a touchscreen. Rock fans, don’t worry, it has some of its own advantages. 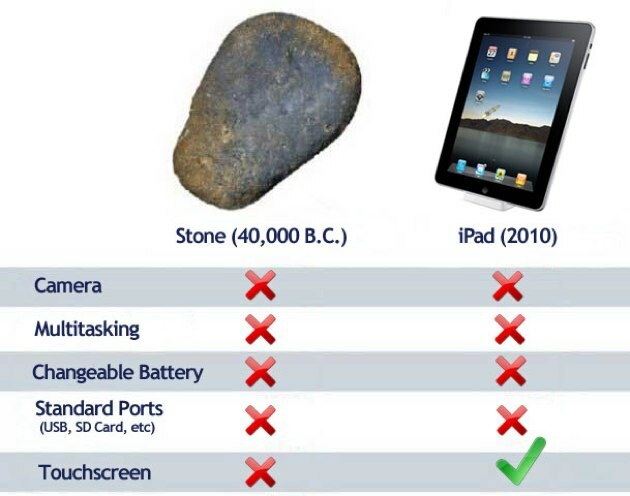 While the iPad costs $499 to $829 depending on the model, a rock is ACTUALLY FREE! The rock will be easy to dispose of without damaging the environment. There are even certain models of rock known as slates. If you want a smaller screen, break off a chunk of it. If you want a bigger screen, get a new one for FREE. So, it depends on what you want from your handheld or tablet device, but if you’re thinking of buying an iPad, always remember to consider the cheaper alternative. Humor aside, you can check out at the following site some cool, new Apple iPad Tablets if you wish to purchase new iPads.